Manager Ronny Deila thinks Celtic are in the "perfect situation" ahead of Tuesday's Champions League play-off second leg against Malmo. Deila made nine changes for Saturday's 3-1 win over Dundee United. "I'm very satisfied," said Deila. "It's a tough game mentally after Wednesday [the 3-2 win over Malmo in Glasgow]. "We made a lot of changes but we have a strong squad. We took some risks but we made it and now we have the best preparation we can have into the game." Leigh Griffiths' opener was followed by a Mark Durnan own goal but Chris Erskine netted a United reply from the penalty spot before half time. A deflected Callum McGregor strike in the second half rounded off Celtic's win. "I'm happy with the performance and I'm happy with the three points," Deila added. "It's important to keep on winning in the league. Many showed good quality. A lot of players got good confidence. "We scored three goals. We should've scored more - that's the biggest issue. But I'm happy with three points." Dundee United manager Jackie McNamara bemoaned a lack of confidence from his side but was pleased with how his players passed the ball. 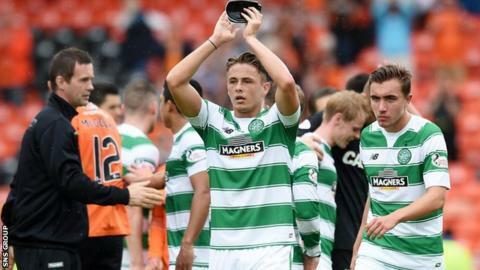 "The biggest thing is belief at this level," said the former Celtic captain. "The little things that cost us there, especially first half, is believing in each other. "When we do it, we look a good side and play without fear. "In the first half [we] sat off them and let them play. We got punished with not concentrating. We've lost two goals from our corners. "I feel a wee bit unlucky with the goals we lost, especially the last one with a cruel deflection. "We've had a lot of changes as well - six players out. You can look at it all different ways. "They have to have a strong squad because they're trying to get into the Champions League. That's the gulf. Their budget will dwarf everybody. That's nothing new, that's always been there. "It doesn't matter what changes there are, they spend a lot of money to get players there and they're all good players that are good enough to play, whether they are rested or not."